Press Release - Pasadena Police will be closing Rose Parade route 10:00 PM 12/31/17 until 2:00 PM 1/1/2018. The Pasadena Police Department will begin closing the route used for the annual Rose Parade effective 10 p.m., Sunday, December 31, 2017. The closures will occur along Colorado Boulevard, at Orange Grove Boulevard, east to Sierra Madre Boulevard; and up Sierra Madre Boulevard to Paloma Street. The earlier closure time for most of the route is being done to enhance public safety and provide for a more efficient deployment of public safety resources. Key intersections will be staffed by law enforcement personnel to allow vehicles to cross Colorado Boulevard, either north or south, until 6 a.m. Monday, January 1, 2018, at which time the entire route will be closed to all public vehicles. Chief Sanchez said the changes were done in full cooperation with the Tournament of Roses Association as well as other key stakeholders, other law enforcement agencies and security experts. “It is important to inform the public now so that everyone can plan accordingly if they intend to be in Pasadena on New Year’s Eve, whether for a private party, dinner at a local restaurant or to find a favorite parade viewing spot. Streets will close early this year,” Chief Sanchez said. Notices and maps are being mailed out to merchants, businesses and residents along the route this week to help keep them informed of the security changes. 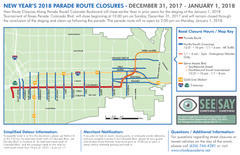 The City’s map shows the parade route, street closures and intersections that will be open to allow for north- and south-bound traffic to cross Colorado Boulevard. For intersections that will close early, there will be no exceptions to the closures except for public safety purposes. Police Chief Sanchez, Pasadena Fire Chief Bertral Washington, Rose Parade and other City Officials will also hold Pasadena’s annual Public Safety Press Conference on Thursday, Dec. 21, 2017, to provide up-to-the-minute safety information in final preparation for the parade and bowl game. A separate media advisory for be sent to working press for that event. The map and other public safety information for the Rose Parade and Rose Bowl Game will be posted on the City’s website, www.cityofpasadena.net. For all other event information go to www.tournamentofroses.com; on Twitter, @RoseParade, https://twitter.com/RoseParade; Facebook, @roseparade, www.facebook.com/roseparade. On Twitter, follow Pasadena, @PasadenaGov, www.twitter.com/pasadenagov and Pasadena Police, @PasadenaPD. On Instagram @PasadenaGov, www.instagram.com/pasadenagov; and Facebook, @cityofpasadena, www.facebook.com/cityofpasadena. Or call the Pasadena Citizen Service Center, www.cityofpasadena.net/Citizen-Service-Center, 7:30 a.m. to 5 p.m., Monday through Friday at (626) 744-7311.